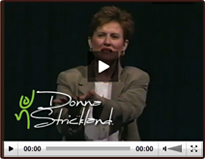 As a nationally acclaimed speaker and organizational development consultant, Donna Strickland’s clients include Fortune 500 companies, government agencies, physician owned companies, large and small health care systems and family owned businesses. She is known for the transformational work she does with organizations, creating effective leaders and leveraging talent to elevate performance. The four day skill building program really helped us better understand the skills needed to be a 21st Century leader. [We] can’t say enough about your program and the teambuilding it did for our group and the expert facilitation you provided. The focus on conflict resolution, coaching, mentoring, being visionary and dealing with change on a daily basis was quite timely. Donna, you truly have the gift of communication and encouragement. Many people specifically mentioned how adept you are at ‘bringing us down’ to the not-so-pretty reality, then flipping us back to hilarity in the next breath… no easy feat. Thank you for inspiring us during our annual meeting. What a great way to add some personal insight to a healthcare-intensive meeting. The program was excellent. Those who attended went back to their roles with concrete plans to help our organization become even more successful. And I know each and every one of them is grateful for the warm and open environment you created. Thank you for making the event a resounding success! Your great sense of humor and tender heart made you a life saver for our careers in the 21st century. We can cope with the chaos and take those career risks with a whole new approach! Our organizations are using the techniques weeks after the workshop. You did an exceptional job customizing the program to recognize the issues within our organization and connect with staff. You provided a relaxed, fun environment while delivering a powerful message. We now have the tools to understand the many emotions we are experiencing in these difficult times. Berkshire Physicians & Surgeons, P.C. I would highly recommend team building activities with Donna and I believe you will not only see results but have fun doing it. It has been a true learning experience. Donna has given us many tools to help make our team healthy again. My production group found [Donna] to be quite capable, professional, and yet fun and flexible enough to meet the individual needs of the people and the overall group. I heartily recommend Donna. I believe anyone who utilizes her skills will learn a great deal, have fun while doing it, and will find themselves growing in heart and spirit throughout the process. Thank you much for the excellent work that you have been providing to the development of our team. You have played a key role in helping the formation of our team and I get extremely positive feedback from all of our members. With your outstanding organizational skills, professionalism and keen insight to the team’s development, I feel that we can move some mountains in the coming year. ‘Fantastic,’ ‘wonderful,’ ‘hilarious,’ ‘just what the doctor ordered,’ ‘extremely insightful.’ These were some of the many, very positive comments I received after your seminar. Thank you so much for reminding us that we need to laugh and keep our sense of humor during these very difficult times of ‘transformation.’ Your message helped us to understand the many emotions people experience during change and transition and that it is OK to feel them. I wanted to thank you for the tremendous workshop you brought to our staff members. It was an honor having you as our guest to kick-off Nurses Week. I feel that your ability to communicate in a relaxed and professional manner, together with the best therapy — laughter, have made this workshop one of the highest rated we have ever had for this System. Kathleen A. Ladner, R.N., Ph.D. I am writing to thank you once again for the tremendous presentation you did for our conference. They are all still talking about how valuable your message was for them. We also received the evaluation feedback forms which gave your presentation the highest marks for the entire conference. I think it speaks to the passion and enthusiasm that you bring to your ‘play.’ I hope that you are able to continue this wonderful work. Thank you again for the presentation you gave to our Marketing and Communications group. [It] was a delightful, humorous and meaningful way to end our three day seminar. The feedback we received rated your portion of the program as excellent. You helped us all to remember the true priorities in life. Donna, your method of presenting very serious information with just the right amount of humor is a very special gift that you share in a most effective manner. Using the ‘Healing Circle’ at the end of the session left everyone with a very personal connection. Donna, we look forward to your return to Kentucky. It was a pleasure for all of us that worked with you during the planning stages of the conference. As indicated by the very positive evaluations, it was indeed a pleasure for the many that attended your workshops. The conference was a tremendous success. You really got people laughing, as well as thinking, which is important. You received raving reviews. You lifted their spirits and helped them face the fact that they can and should use humor and laughter to deal with stress. Your enthusiasm and dynamic personality/ presentation style is so effective and contagious.